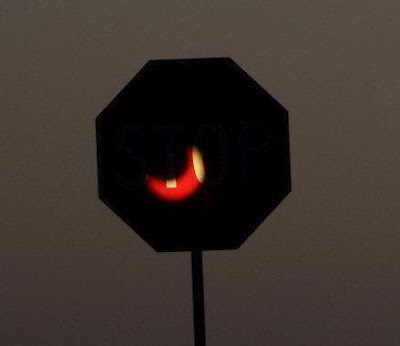 After long, fruitless years of studying, I have finally done it: I have found a legitimate use for stop signs! They are good screens for projecting annular solar eclipses on. I was happy to be along the path of this evening's eclipse and by using a mirror I was able to watch the reflection of the whole thing (until the sun set). Awesome! I also used a pinhole and reflections in car windows and another group of eclipse watchers let me look through their welding helmet as well. And I did sneak some peeks as the sun set and was dimmed by haze. 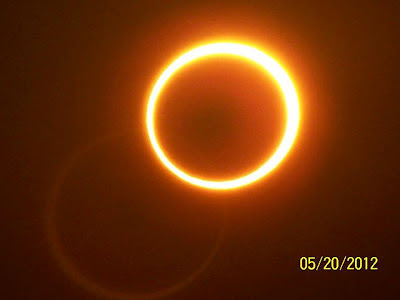 Here's a regular picture of the annular eclipse taken by my mom during the maximum. Since I was right in the path of this one, I made sure I didn't forget. But I also check spaceweather.com every day. Very cool! I was a bit south of "the path", but it was still an interesting sight. I think I may post a few more pics. My mom took the best ones.